Expansion of the Urnfield Culture. The Urnfield culture (c. 1300 BC - 750 BC) was a late Bronze Age culture of central Europe. The name comes from the custom of cremating the dead and placing their ashes in urns which were then buried in fields. The Urnfield culture followed the Tumulus culture and was succeeded by the Hallstatt culture. The existence of the Ha B3-phase is contested, as the material consists of female burials only. As can be seen by the arbitrary 100-year ranges, the dating of the phases is highly schematic. The phases are based on typological changes, which means that they do not have to be strictly contemporaneous across the whole distribution. All in all, more radiocarbon- and dendro-dates would be highly desirable. The Urnfield culture grew from the preceding tumulus culture. The transition is gradual, in the pottery as well as the burial rites. In some parts of Germany, cremation and inhumation existed simultaneously (facies Wölfersheim). Some graves contain a combination of tumulus-culture pottery and Urnfield swords (Kressborn, Bodenseekreis) or tumulus culture incised pottery together with early Urnfield types (Mengen). In the North, the Urnfield culture was only adopted in the HaA2 period.16 pins deposited in a swamp in Ellmoosen (Kr. Bad Aibling, Germany) cover the whole chronological range from Bronze B to the early Urnfield period (Ha A). This demonstrates a considerable ritual continuity. In the Loire , Seine and Rhône, certain fords contain deposits from the late Neolithic onwards up to the Urnfield period. The origins of the cremation rite is commonly believed to be the Balkans, where it was widespread in the eastern part of the Tumulus culture. Some cremations begin to be found in the Proto-Lusatian and Trzciniec-culture. Unstrut group in Thuringia , a mixture between Knovíz-culture and the South-German Urnfield culture. Lower-Main-Swabian group in southern Hesse and Baden-Württemberg, including the Marburger , Hanauer , lower Main and Friedberger facies. Rhenish-Swiss group in Rhineland-Palatinate, Switzerland and eastern France , (abbreviated RSFO in French). Northwest-Group in the Dutch Delta region. Sometimes the distribution of artefacts belonging to these groups shows sharp and consistent borders, which might indicate some political structures, like tribes. Metalwork is commonly of a much more widespread distribution than pottery and does not conform to these borders. It may have been produced at specialised workshops catering for the elite of a large area. Important French cemeteries include Châtenay and Lingolsheim (Alsace). An unusual earthworks was constructed at Goloring near Koblenz in Germany . The eastern European Lusatian culture forms part of the urnfield tradition, but continues into the Iron Age without a notable break. The Piliny culture in northern Hungary and Slovakia grew from the tumulus culture, but used urn burials as well. The pottery shows strong links to the Gáva-culture, but in the later phases, a strong influence of the Lusatian culture is found.Urnfields are found in the French Languedoc from the 9th to 8th centuries. The change in burial custom was most probably influenced by developments further east. As there are no written sources, the languages spoken by the bearers of the Urnfield culture are unknown. Some scholars consider them to be the ancestors of the Celts. Urnfield material is found in some of the areas where later people were to be called "Keltoi" or "Galatai" by classical authors (who had never been there). As we do not know how processes of ethnogenesis work or how long they last, and whether a common material culture is always associated with social and political unity, this is highly contested. Some scholars, among them Wolfgang Kimmig and P. Bosch-Gimpera have postulated a Europe-wide wave of migrations. The so-called Dorian invasion of Greece was placed in this context as well (although more recent evidence suggests that the Dorians moved in 1100 BC into a post Mycenaean vacuum, rather than precipitating the collapse). Better methods of dating have shown that these events are not as closely connected as once thought. More recently Robert Drews, after having reviewed and dismissed the migration hypothesis, has suggested that the observed cultural associations may be in fact partly explained as the result of a new kind of warfare based upon the slashing Niue sword, and with bands of infantry replacing chariots in warfare. Drews suggests that the political instability that this brought to centralised states based upon maryannu chariotry caused the breakdown of these polities. The number of settlements increased sharply in comparison with the preceding tumulus culture. Unfortunately, few have been comprehensively excavated.Fortified settlements, often on hilltops or in river-bends, are typical for the urnfield culture. They are heavily fortified with dry-stone or wooden ramparts. Excavations of open settlements are rare, but they show that large 3-4 aisled houses built with wooden posts and wall of wattle and daub were common. Pit dwellings are known as well, they might have served as cellars. The houses were one or two-aisled. Some were quite small, 4.5 m x 5 m at the Runde Berg (Urach, Germany), 5-8m long in Künzig (Bavaria, Germany), others up to 20 m long. They were built with wooden posts and walls of wattle and daub.At the Velatice-settlement of Lovčičky (Moravia, CR) 44 houses have been excavated.Large bell shaped storage pits are known from the Knovíz-culture. The settlement of Radonice (Louny) contained over 100 pits. They were most probably used to store grain and demonstrate a considerable surplus-production. On lakes of southern Germany and Switzerland, numerous pile dwellings were constructed. They consist either of simple one-room houses made of wattle and daub, or log-built. The settlement at Zug , Switzerland, was destroyed by fire and gives important insights into the material culture and the settlement organisation of this period. It has yielded a number of dendro-dates as well. Fortified hilltop settlements become common in the Urnfield period. Often a steep spur was used, where only part of the circumference had to be fortified. Depending on the locally available materials, dry-stone walls, gridded timbers filled with stones or soil or plank and palisade type pfostenschlitzmauer fortifications were used. Other fortified settlements utilise rivers-bends and swampy areas. At the hill fort of Hořovice near Beroun (CR), 50 ha were surrounded by a stone wall. Most settlements are much smaller. Metal working is concentrated in the fortified settlements. On the Runde Berg near Urach, Germany, 25 stone mould have been found. Hillforts are interpreted as central places. Some scholars see the emergence of hill forts as a sign of increased warfare. Most hillforts were abandoned at the end of the Bronze Age. As far as we know, there are no special dwellings for an upper class, but few settlements have been excavated to any extent. In the Franche-Comté , caves were utilised for settlement, maybe in times of trouble. The pottery is normally well made, with a smooth surface and a normally sharply carinated profile. Some forms are thought to imitate metal prototypes. Biconical pots with cylindrical necks are especially characteristic. There is some incised decoration, but a large part of the surface was normally left plain. Fluted decoration is common. In the Swiss pile dwellings, the incised decoration was sometimes inlaid with tin foil.Pottery kiln were already known (Elchinger Kreuz, Bavaria), as is indicated by the homogeneous surface of the vessels as well.Other vessels include cups of beaten sheet-bronze with riveted handles (type Jenišovice) and large cauldrons with cross attachments. Wooden vessels have only been preserved in waterlogged contexts, for example from Auvernier (Neuchâtel), but may have been quite widespread. 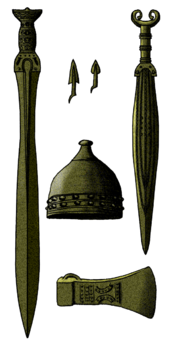 Typical bronze tools include winged and socketed axes. In the North, stone axes were still in use. The leaf-shaped Urnfield sword could be used for slashing, in contrast to the stabbing-swords of the preceding tumulus culture. It commonly possessed a ricasso. The hilt was normally made from bronze as well. It was cast separately and consisted of a different alloy. These solid hilted swords were known since Bronze D (Rixheim swords). Other swords have tanged blades and probably had a wood, bone, or antler hilt. Flange-hilted swords had organic inlays in the hilt. Swords include Auvernier, Kressborn-Hemigkofen, Erbenheim, Möhringen, Weltenburg, Hemigkofen and Tachlovice-types. Protective gear like shields, cuirasses, greaves and helmets are extremely rare and almost never found in burials. The best-known example of a bronze shield comes from Plzeň in Bohemia and has a riveted handhold. Comparable pieces have been found in Germany, Western Poland, Denmark, Great Britain and Ireland. They are supposed to have been made in upper Italy or the Eastern Alps and imitate wooden shields. Irish bogs have yielded examples of leather shields (Clonbrinn, Co. Wexford). Bronze cuirasses are known since Bronze D (Čaka , grave II, Slovakia). Complete bronze cuirasses have been found in Saint Germain du Plain, nine examples, one inside the other, in Marmesse, Haute Marne (France), fragments in Albstadt-Pfeffingen (Germany). Bronze dishes (phalerae) may have been sewn on a leather armour. Greaves of richly decorated sheet-bronze are known from Kloštar Ivanić (Croatia) and the Paulus cave near Beuron (Germany). About a dozen wagon-burials of four wheeled wagons with bronze fittings are known from the early Urnfield period. They include Hart an der Altz (Kr. Altötting), Mengen (Kr. Sigmaringen), Poing (Kr. Ebersberg), Königsbronn (Kr. Heidenheim) from Germany and St. Sulpice (Vaud ), Switzerland. In Alz, the chariot had been placed on the pyre, pieces of bone are attached to the partially melted metal of the axles. Bronze (one-part) bit appear at the same time. Two-part horse bits are only known from late Urnfield contexts and may be due to eastern influence. Wood- and bronze spoked wheels are known from Stade (Germany), a wooden spoked wheel from Mercurago, Italy. Wooden dish-wheels have been excavated at Corcelettes, Switzerland and the Wasserburg-Buchau, Germany (diameter 80 cm). In Milavče near Domažlice , Bohemia, a four-wheeled miniature bronze wagon bearing a large cauldron (diameter 30 cm) contained a cremation. This exceptionally rich burial was covered by a barrow. The wagon from Acholshausen (Bavaria) comes from a male burial. Such wagons are known from the Nordic Bronze Age as well. The wagon from Skallerup, Denmark, contained a cremation as well. At Pekatel (Kr. Schwerin) in Mecklenburg a cauldron-wagon and other rich grave goods accompanied an inhumation under a barrow (Montelius III/IV). Another example comes from Ystad in Sweden. South-eastern European examples include Kanya in Hungary and Orăştie in Romania . Clay miniature wagons, sometimes with waterfowl were known there since the middle Bronze Age (Dupljaja, Vojvodina, Serbia). The Lusatian chariot from Burg (Brandenburg , Germany) has three wheels on a single axle, on which waterfowl perch. The grave of Gammertingen (Kr. Sigmaringen, Germany) contained two socketed horned applications that probably belonged to a miniature wagon comparable to the Burg example, together with six miniature spoked wheels. Hoards are very common in the Urnfield culture. The custom is abandoned at the end of the Bronze Age. They were often deposited in rivers and wet places like swamps. As these spots were often quite inaccessible, they most probably represent gifts to the gods. Other hoards contain either broken or miscast objects that were probably intended for reuse by bronze smiths. As Late Urnfield hoards often contain the same range of objects as earlier graves, some scholars interpret hoarding as a way to supply personal equipment for the hereafter. In the river Trieux, Côtes du Nord , complete swords were found together with numerous antlers of red deer that may have had a religious significance as well. An iron ring from Vorwohlde (Kr. Grafschaft Diepholz, Germany) dating to the 15th century BC is the earliest evidence of iron in Central Europe. During the late Bronze Age, Iron was used to decorate the hilts of swords (Schwäbisch-Hall-Gailenkirchen, Unterkrumbach, Kr. Hersbruck) and knives (Dotternhausen, Plettenberg, Germany) and pins. The use of iron for weapons and domestic items in Europe only started in the following Hallstatt culture. The widespread use of iron for tools only occurred in the late Iron Age La Tène culture . Cattle, pigs, sheep and goats were kept, as well as horses and dogs, and maybe geese. The cattle were rather small, with a height of 1.20 m at the withers. Horses were not much bigger with a mean of 1.25 m.
Forest clearance was intensive in the Urnfield period. Probably open meadows were created for the first time, as shown by pollen analysis. This led to increased erosion and sediment-load of the rivers. Wheat and barley were cultivated, together with pulses and the horse bean. Poppy seeds were used for oil or as a drug. Millet and oats were cultivated for the first time in Hungary and Bohemia, rye was already cultivated, further west it was only a noxious weed. Flax seems to have been of reduced importance, maybe because mainly wool was used for clothes.Hazel nuts, apples, pears, sloes and acorns were collected. Some rich graves contain bronze sieves that have been interpreted as wine-sieves (Hart an der Alz). This beverage would have been imported from the South, but supporting evidence is lacking.In the lacustrine settlement of Zug, remains of a broth made of spelt and millet have been found. In the lower-Rhine urnfields, leavened bread was often placed on the pyre and burnt fragments have thus been preserved. Wool was spun (finds of spindle whorls are common) and woven on the warp-weighted loom, bronze needles (Unteruhldingen) were used for sewing. There is some suggestion that the Urnfield culture too is associated with a wetter climatic period than the earlier Tumulus cultures. This may be associated with the diversion of the mid-latitude winter storms north of the Pyrenees and the Alps, possibly associated with drier conditions in the Mediterranean basin. In the tumulus-period, multiple inhumations under barrows were common, at least for the upper levels of society. In the Urnfield period, inhumation and burial in single graves prevails, though some barrows exist. In the earliest phases of the Urnfield period, man-shaped graves were dug, sometimes provided with a stone lined floor, in which the cremated remains of the deceased were spread. Only later, burial in urns became prevalent. Some scholars speculate that this may have marked a fundamental shift in people's beliefs or myths about life and the afterlife. The size of the urnfields is variable. In Bavaria, they can contain hundreds of burials, while the largest cemetery in Baden-Württemberg in Dautmergen has only 30 graves.The dead were placed on pyres, covered in their personal jewellery, which often shows traces of the fire and sometimes food-offerings. The cremated bone-remains are much larger than in the Roman period, which indicates that less wood was used. Often, the bones have been incompletely collected.Most urnfields are abandoned with the end of the Bronze Age, only the Lower Rhine urnfields continue in use in the early Iron Age (Ha C, sometimes even D). The cremated bones could be placed in simple pits. Sometimes the dense concentration of the bones indicates a container of organic material, sometimes the bones were simply shattered.If the bones were placed in urns, these were often covered by a shallow bowl or a stone. In a special type of burial (bell-graves) the urns are completely covered by an inverted larger vessel. As graves rarely overlap, they may have been marked by wooden posts or stones.Stone-pacing graves are typical of the Unstrut group. An urn for the ashes and dishes for grave offerings. Typical burial of cremation urn. The urn containing the cremated bones is often accompanied by other, smaller ceramic vessels, like bowls and cups. They may have contained food. The urn is often placed in the centre of the assemblage. Often, these vessels have not been placed on the pyre. Metal grave gifts include razors, weapons that often have been deliberately destroyed (bent or broken), bracelets, pendants and pins. Metal grave gifts become rarer towards the end of the Urnfield culture, while the number of hoards increase.Burnt animal bones are often found, they may have been placed on the pyre as food. The marten bones in the grave of Seddin may have belonged to a garment (pelt).Amber or glass beads (Pfahlbautönnchen) are luxury items. Upper-class burials were placed in wooden chambers, rarely stone cists or chambers with a stone-paved floor and covered with a barrow or cairn. The graves contain especially finely made pottery, animal bones, usually pork, sometimes gold rings or sheets, in exceptional cases miniature wagons.Some of these rich burials contain the remains of more than one person. In this case, women and children are normally seen as sacrifices. Until more is known about the status distribution and the social structure of the late Bronze Age, this interpretation should be viewed with caution.Towards the end of the Urnfield period, some bodies were burnt in situ and then covered by a barrow, reminiscent of the burial of Patroclus as described by Homer and the burial of Beowulf (with the additional ship burial element). In the early Iron Age, inhumation became the rule again. The Kyffhäuser caves in Thuringia contain headless skeletons and split human and animal bones that have been interpreted as sacrifices. Other deposits include grain, knotted vegetable fibres and hair and bronze objects (axes, pendants and pins). The Ith -caves (Lower Saxony ) have yielded comparative material. In the Knovíz-culture, human bones with cut-marks and traces of burning have been found in settlement pits. They have been interpreted as evidence for cannibalism. As these bones form a large part of the burials known this may have been a quite regular treatment including the ritual manipulation and dismemberment of human corpses.Moon-shaped clay fire dogs are thought to have a religious significance, as well as crescent shaped razors. An obsession with waterbirds is indicated by numerous pictures and three-dimensional representations. Combined with the hoards deposited in rivers and swamps, it indicates religious beliefs connected with water. This has led some scholars to believe in serious droughts during the late Bronze Age.Sometimes the water-birds are combined with circles, the so called sun-barque-motif. Association Abbaye de Daoulas (eds. ), Avant les Celtes. L'Europe a l'age du Bronze (Daoulas 1988).